The Hieromartyr Autonomus was a bishop in Italy. During the time of the persecution against Christians under the emperor Diocletian (284-305), Saint Autonomus left his own country and resettled in Bithynia, in the locality of Soreia with the wanderer Cornelius. Saint Autonomus did his apostolic duty with zeal and converted to Christ so many pagans, that a large Church was formed, for which he consecrated a temple in the name of the Archangel Michael. For this church, the saint at first ordained Cornelius as deacon, and then presbyter. Preaching about Christ, Saint Autonomus visited also Likaonia and Isauria. The emperor Diocletian gave orders to arrest Saint Autonomus, but the saint withdrew to Claudiopolis on the Black Sea. In returning to Soreia, he had Presbyter Cornelius ordained bishop. Saint Autonomus then set out to Asia, and when he had returned from there, he began to preach in the vicinity of Limna, nearby Soreia. One time, the newly-converted destroyed a pagan temple. The pagans decided to take revenge on the Christians. Seizing their chance, the pagans rushed upon the church of the Archangel Michael when Saint Autonomus was serving Divine Liturgy there, and after torturing Saint Autonomus they killed him, reddening the altar of the church with his martyr’s blood. The deaconess Maria extracted the body of the holy martyr from beneath a pile of stones and gave it burial. During the reign of Saint Constantine the Great a church was built over the place of burial of the saint. In about the year 430 a certain priest had the decaying church pulled down. And not knowing that beneath the church had been buried the body of the martyr, he rebuilt the church in a new spot. 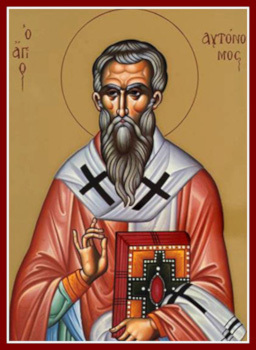 But after another sixty years the relics of the saint were found undecayed, and a church was then built in the name of the Hieromartyr Autonomus.